Today marks the tenth anniversary of the death of my dear friend and mentor, John Claypool. To commemorate his passing – and celebrate his enduring legacy – I’ve composed this reflection, portions of which appear in the September 2015 issue of Baptists Today, alongside the reminiscences of others who were fortunate enough to learn from him during his time at the McAfee School of Theology. I don’t have to look far to be reminded of John Claypool each day. In our house hangs a copy of a black and white photograph showing the Rev. Dr. Claypool and the Rev. Dr. Martin Luther King, Jr. having coffee in the refectory of Southern Seminary on the day the civil rights icon visited the campus in 1961. It’s very special to me – and not just for featuring two men whom I believe to be 20th century saints in the same frame. It’s special because, like most everything to do with John Claypool, there’s a story behind it: a story about choosing love and grace over all other available options. My wife gave me this photograph as a Christmas present. Dr. Claypool brought the original from the Louisville Courier-Journal with him to class one day in 2002 as a prelude to the day’s lesson. As an aspiring preacher, seeing my professor with Martin Luther King, Jr. was like a basketball player seeing his coach with Michael Jordan. But Dr. Claypool hadn’t brought the picture to brag. He’d brought it to illustrate a point. That picture got him into a whole lot of trouble. 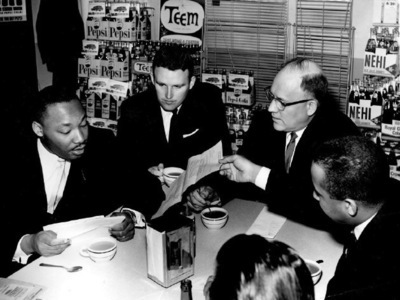 John Claypool (second from left) shares coffee with Martin Luther King, Jr. at Southern Seminary in 1961. Dr. Claypool was the Pastor of Crescent Hill Baptist Church in Louisville at the time, and as soon as the paper hit the stands he knew he had to brace for the backlash. It was one thing to be present when the prestigious Southern Seminary hosted a controversial but undeniably significant figure like King; it was quite another to be spotted sharing refreshment with a Black man, especially an “agitator” and a rumored Communist. Dr. Claypool knew what people in town would think – and perhaps do. But Dr. King had asked if there was a place to get a cup of coffee before he gave his address, so Dr. Claypool led the way. To hear him tell it, it was as simple as that. Of course, what he really did was make a profound choice. He chose the grace of hospitality over the safety of propriety. He chose to share a cup of coffee in calm, holy defiance of his culture’s bigoted, ungodly conventions. The humility with which Dr. Claypool shared this photograph, and the openness with which he told the story behind it, forever endeared him to me as a mentor and exemplar of prophetic pastoral leadership. Throughout our time together, Dr. Claypool impressed upon me that simple but purposeful acts lie at the heart of Christian witness. Living intentionally out of Christ’s love, compassion, and generosity matters more than profound exegesis or homiletic agility. It’s through such simple yet purposeful acts, like welcoming the outsider, that you tell Christ’s story through your story. It’s through such simple yet purposeful acts, like the breaking of bread and the sharing of a cup, that God has long revealed God’s self. Dr. King was indeed a gadfly, one with a sting every bit as sharp as Socrates.’ For that reason, he was not always the celebrated hero we remember today. Especially when he began following the moral threads of the struggle for Civil Rights beyond the boundaries of race into the adjacent territories of the Vietnam War and poverty, he ceased to be a noble pest and became a bona fide threat in the eyes of many who once supported him. When he couldn’t be shooed away, he was swatted. Yet, as Eugene Robinson points out, the fact that King’s message is still relevant in our time demonstrates he was spurring us in the right direction. Fifty years after Dr. King paid the ultimate price for the cause of justice, many of his speeches read as if they were written yesterday. If we wonder why we haven’t put more distance between our age and his, surely one reason is that we still refuse to heed King’s warning that we cannot achieve racial equality without confronting economic injustice. Civil Rights and economic opportunity are not separate issues. Addressing one without tending to the other is akin to treating a cough while ignoring the accompanying fever. They are both symptoms of the same underlying respiratory infection that continues to afflict American society and threatens to suffocate the American Dream. We are effectively trying to run a race while suffering from pneumonia. Until we recognize and deal with the infection, we will never see the finish line. We can’t breathe deeply enough. To honor Dr. King on his national holiday, I share with you this lengthy excerpt from a speech he gave in March 1968 to a gathering of striking sanitation workers in Memphis, TN – the same group he would address a month later the night before he was assassinated. In it he makes the case for why we must wage the battle for justice on two fronts simultaneously. You are doing many things here in this struggle. You are demanding that this city will respect the dignity of labor. So often we overlook the work and the significance of those who are not in professional jobs, of those who are not in the so-called big jobs. But let me say to you tonight, that whenever you are engaged in work that serves humanity and is for the building of humanity, it has dignity, and it has worth. One day our society must come to see this. One day our society will come to respect the sanitation worker if it is to survive, for the person who picks up our garbage, in the final analysis, is as significant as the physician, for if he doesn’t do his job, diseases are rampant. All labor has dignity. But you are doing another thing. You are reminding, not only Memphis, but you are reminding the nation that it is a crime for people to live in this rich nation and receive starvation wages. And I need not remind you that this is our plight as a people all over America. The vast majority of Negroes in our country are still perishing on a lonely island of poverty in the midst of a vast ocean of material prosperity. My friends, we are living as a people in a literal depression. Now you know when there is mass unemployment and underemployment in the black community they call it a social problem. When there is mass unemployment and underemployment in the white community they call it a depression. But we find ourselves living in a literal depression, all over this country as a people. Now the problem is not only unemployment. Do you know that most of the poor people in our country are working every day? And they are making wages so low that they cannot begin to function in the mainstream of the economic life of our nation. These are facts which must be seen, and it is criminal to have people working on a full-time basis and a full-time job getting part-time income. You are here tonight to demand that Memphis will do something about the conditions that our brothers face as they work day in and day out for the well-being of the total community. You are here to demand that Memphis will see the poor. You know Jesus reminded us in a magnificent parable one day that a man went to hell because he didn’t see the poor. His name was Dives. And there was a man by the name of Lazarus who came daily to his gate in need of the basic necessities of life, and Dives didn’t do anything about it. And he ended up going to hell. There is nothing in that parable which says that Dives went to hell because he was rich. Jesus never made a universal indictment against all wealth. It is true that one day a rich young ruler came to Him talking about eternal life, and He advised him to sell all, but in that instance Jesus was prescribing individual surgery, not setting forth a universal diagnosis. If you will go on and read that parable in all of its dimensions and its symbolism you will remember that a conversation took place between heaven and hell. And on the other end of that long-distance call between heaven and hell was Abraham in heaven talking to Dives in hell. It wasn’t a millionaire in hell talking with a poor man in heaven, it was a little millionaire in hell talking with a multimillionaire in heaven. Dives didn’t go to hell because he was rich. His wealth was his opportunity to bridge the gulf that separated him from his brother Lazarus. Dives went to hell because he passed by Lazarus every day, but he never really saw him. Dives went to hell because he allowed Lazarus to become invisible. Dives went to hell because he allowed the means by which he lived to outdistance the ends for which he lived. Dives went to hell because he maximized the minimum and minimized the maximum. Dives finally went to hell because he sought to be a conscientious objector in the war against poverty. Now you are doing something else here. You are highlighting the economic issue. You are going beyond purely civil rights to questions of human rights. That is a distinction. We’ve fought the civil rights battle over the years…. Now all of these were great movements. They did a great deal to end legal segregation and guarantee the right to vote. With Selma and the voting rights bill one era of our struggle came to a close and a new era came into being. Now our struggle is for genuine equality, which means economic equality. For we know now that it isn’t enough to integrate lunch counters. What does it profit a man to be able to eat at an integrated lunch counter if he doesn’t earn enough money to buy a hamburger and a cup of coffee? What does it profit a man to be able to eat at the swankiest integrated restaurant when he doesn’t earn enough money to take his wife out to dine? What does it profit one to have access to the hotels of our city and the motels of our highway when we don’t earn enough money to take our family on a vacation? What does it profit one to be able to attend an integrated school when he doesn’t earn enough money to buy his children school clothes? May Dr. King’s words continue to sting that we may yet be roused to greater heights of understanding and brotherhood, and finally achieve liberty and justice for all.